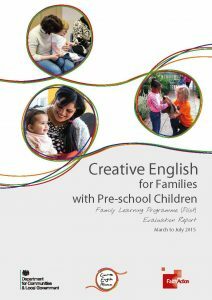 Dr Anne Smith, author of the original Creative English programme, found that learning conversational English through fun play-based activities with the whole family in a safe environment quickly builds trust and community between parents, children and facilitator. Each session strengthens the relationship between parent and child with craft, role-play, story-telling and games they take part in together. By focusing on participants who would not normally engage with child-centered activities, Family Learning helps created a strong foundation for starting school. At the end of each session, adults will have developed increased confidence in using conversational English in everyday settings, while children will have made progress towards milestones in line with the Statutory Framework for the Early Years Foundation Stage. Between March and July of 2015, a pilot of the Family Learning Programme was run by five organisations around the country, with the scheme funded by the Department of Communities and Local Government. In total, six 10-week programmes were run, utilising different methods, and the outcomes of these were used to compile an evaluation of the Family Learning programme. The Family Learning programme was shortlisted for a British Council ELTons Award for Local Innovation in 2016. 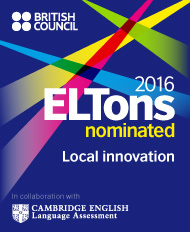 The ELTons are sponsored by Cambridge English, and are the only international award to recognise English language teaching. I really want to thank the ELTons for recognising this programme — it’s great to see adults and children growing in language confidence together on this course. We all benefit from learning through playing! It lays a great foundation for the families and their future schools too. Every Creative English programme is built on an ethos of making people feel included and having fun while learning, and Creative English Family Learning really does that.